The breaking of the glass is a time-honored tradition at Jewish weddings. According to some legends, the broken glass is symbolic of the sentiment that life brings both joy and sadness. Some people believe that the breaking of the glass is a tribute to the destruction of the Temple in Jerusalem. Regardless of what meaning is attached to the tradition, the broken glass is cherished for a lifetime. Like many mementos, the broken glass is something that is put on display as a keepsake of the special day. When you're shopping for broken glass wedding keepsakes, our wedding glass mezuzahs are sure to leave a lasting impression and are ideal for showcasing the treasure within, in an eye-catching fashion. The Jewish Mezuzah is found on doorposts throughout Jewish homes and the beauty of wedding glass mezuzahs is that they marry the two customs to create a great gift and as a constant reminder of God's presence. 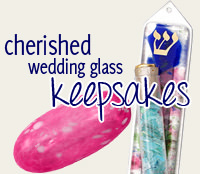 Here at Traditions Jewish Gifts, you'll find a wide selection of wedding glass Mezuzahs, which are great gifts for the new bride and groom who want to preserve their glass shards for years to come. 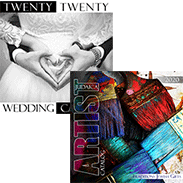 Some of our most popular are the Heart, Entwined Rings, Ani Li Dodi, Woven Wedding Glass Mezuzah, and the Stars and Stones Wedding Glass Mezuzah. For the person who wants to take a piece of the wedding tradition wherever he or she goes, opt for the stylish and ever popular wedding glass Mezuzah pendant. Regardless of your budget, we have broken glass Mezuzahs and broken glass jewelry to fit within your price range.